The long-tailed-pair phase inverter with negative feedback was used by Leo Fender in the 5F6-A Bassman and subsequently became an overwhelming favorite for classic large amp designs, Marshalls in particular. The basic long-tailed-pair without negative feedback is shown in the schematic. 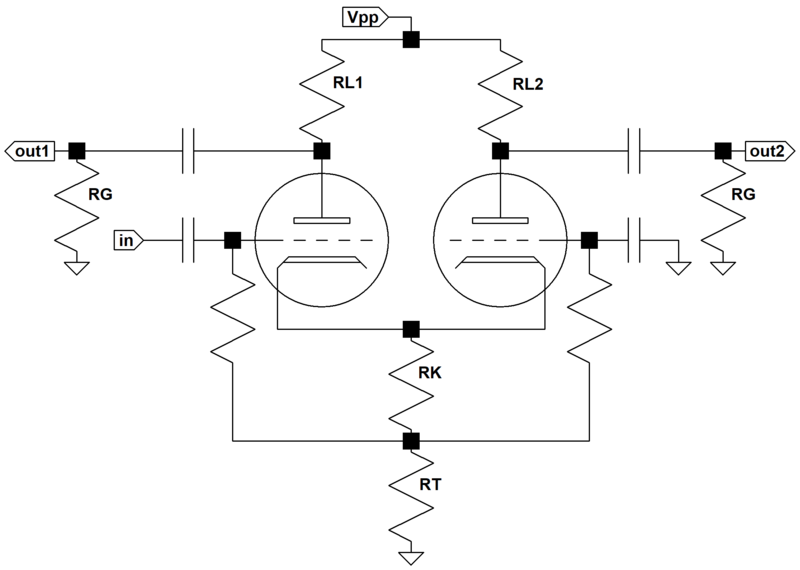 As the input signal voltage increases, the plate current through the left tube increases, causing the inverted output voltage to decrease because of the increased voltage drop across the plate resistor RL1. It also causes the current through the cathode resistor RK and the tail resistor RT to increase, which increases the voltage between the cathodes and ground, thereby making the grid-to-cathode voltage of the right triode more negative, causing its plate current to decrease. This increases the in-phase output voltage. Thus an increase in the phase inverter's input voltage lowers the inverted output voltage and increases the non-inverted output voltage. Negative feedback from the output transformer secondary can be introduced by splitting the tail resistor into two resistors and driving their connection by a signal taken from the output transformer. This particular modification is widely used in classic amps. The Long Tailed Pair Feedback calculator computes the amount of feedback needed to create a desired closed-loop gain. The calculator takes into account the output load of the power amp's grid resistors RG. To get exactly the same gain in each phase (one positive and the other negative) with identical plate resistors, the tail resistance needs to be infinitely large. (This can be demonstrated, for example, by making the plate resistors equal and setting RT to an unrealistically high value like 1MΩ.) Having a large tail resistance limits the maximum output voltage swing, which is of particular concern for high-power amps. For this reason a smaller tail is often required, which causes the inverted phase to have substantially more amplification than the non-inverted phase. The usual correction is to reduce the size of the inverting plate resistor RL1.